Agnete the Pickled is a Nord smith and the proprietor of Hammer and Tongs in Skingrad. She sells weapons and armor and offers repair services. The unique Helm of Ferocity can be purchased here and nowhere else. 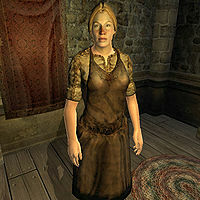 Like most of the Nords in Cyrodiil, Agnete has a very powerful thirst and spends all her evenings downing cheap wine at the Two Sisters Lodge, a fact that concerns many of her townsfolk. As a result, she wakes up every morning at 8am with a hangover, but unlocks the front door anyway and spends the next twelve hours keeping up appearances while offering her various services to customers. At 8pm she finally closes up and immediately heads to the lodge for two hours of binging. At 10pm, she staggers back home, where she spends a bit of time walking around before heading up the stairs to her third-floor bedroom at midnight. Agnete wears typical smith attire: a pair of blacksmith's pants and a blacksmith's apron as well as a pair of rough leather shoes. She also carries the shop key and two or three gold coins. When you meet her for the first time, it becomes apparent that she likes the drink: "Not so loud, please. What a headache I've got. I'm Agnete the Smith. 'The Pickled' they call me. Sure wish I was pickled right now." And she will also provide you with some tips: "Well, the local wine is great. It isn't cheap. But I don't bother with beer or ale any more, and for a Nord, that's saying something." Many townspeople will tell you that she often suffers from headaches in the mornings: "Hammer and Tongs is a good place to get your armor repaired. Just don't go early in the morning. Agnete usually isn't feeling so well then." Skingrad's townsfolk will also express their regrets on Agnete's condition: "It's a shame such a good smith wastes her life in the bottle." They will, however, praise her skills as an armorer: "I saw Agnete out drinking late again last night. It's no wonder they call her "the Pickled." She sure can repair armor, though." and "She can drink all she wants as long as she keeps doing such fine work." Agnete has an overlooked AI package that would have made her wander around Skingrad's eastern bridge between 6am and 8am. However, her sleep package goes on until 8am and is given precedence in the load order. Agnete is mentioned in Alessia Ottus' Guide to Skingrad, although Alessia mistakenly describes Agnete as male. Esta página foi modificada pela última vez à(s) 05h03min de 10 de maio de 2015.